Joggers carry el fuego simbolico de la cabalgata between Dolores Hidalgo and San Miguel de Allende. In the small town of Dolores, Guanajuato, on the 16th of September, 1810, a Catholic priest named Miguel Hidalgo y Costilla rang his church bell urging his countrymen to rise up against Spanish control. This act triggered the Mexican War of Independence and it became known as the Grito de Dolores—often referred to as El Grito. 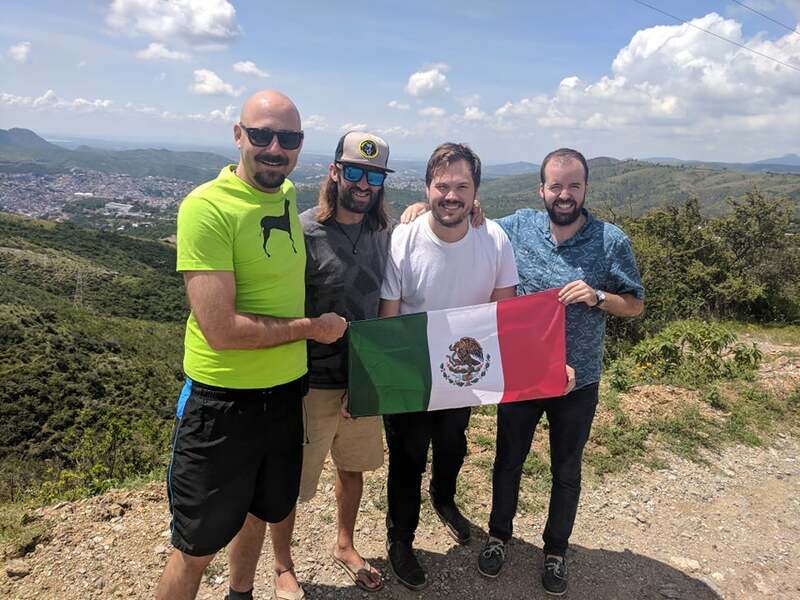 Recently, WeExpats got together for a work reunion at our base of operations in a lovely pueblo in the state of Guanajuato, and we decided to write an article on El Grito in San Miguel de Allende. In reality, it all started out as a prison break much like that of the Bastille in Paris. However, before that, the territory known then as New Spain faced a period of upheaval and unrest. José Bernardo Gutiérrez de Lara had come to speak to Miguel Hidalgo y Costilla to convince him to help in the effort to break the Spanish yoke over New Spain. José Bernardo Gutiérrez de Lara went to Washington D.C. to attempt to secure military support from the Americans—the first Mexican to make the journey—while Miguel Hidalgo remained in Dolores. At his side was Juan Aldama, a man who lived in San Miguel el Grande and would frequently attend secret meetings of revolution in Querétaro. It was in San Miguel that Aldama heard the secret plans for the revolution had been betrayed by a supporter turned traitor who leaked the information to the Spanish authorities. Juan Aldama rushed from San Miguel to Dolores Hidalgo—a trip of 22 miles/36k—to warn Hidalgo of this fact. Aldama would end up becoming a rebel captain and war hero. Accompanying Hidalgo was Ignacio Allende—a Spanish army captain who had begun to sympathize with the independence movement. Fearing imprisonment, Miguel Hidalgo asked his brother Mauricio to urge the sheriff to free all the pro-independence inmates there. It was in the early morning of the 16th that roughly 80 inmates were released. By 2:30 in the morning, the bells of the church were ringing to gather the towns residents. Here he called upon the residents to rise against the Spaniards and Napoleon (Spain was considered a client state of the First French Empire under Joseph Bonaparte I). Hidalgo railed against the notion of monarchy and the social order, as well as emphasizing loyalty to the Catholic religion. However, of all that he professed, “Death to the Gachupines!” (a pejorative for the Spaniards) was perhaps the most radical. This passionate speech came to be known as El Grito de Dolores. Now every year at 11pm on the 15th of September, in Mexico City’s zocalo, the President of the United Mexican States calls out, “¡Viva México!” to commemorate El Grito. This is why fireworks go off at 11pm the night before Mexican Independence Day. The town of Dolores would thereafter be known as Dolores Hidalgo, named after Miguel “The Father of His Country” Hidalgo. And the small pueblo of San Miguel el Grande would take on the name of Ignacio Allende to become known as San Miguel de Allende. Three of the four amigos finally arrive to Guanajuato City in search of history and culture. I live about 6 hours away from our office in San Miguel de Allende, in a town to the south of Mexico City called Cuernavaca. However, me and three colleagues here at WeExpats decided it would be cool to travel around the area surrounding Dolores Hidalgo where the Grito took place 208 years ago. Justin, Tim, and Chandler and I hit the road in search of history. It first began when Chandler and I were getting off work and we came across a marathon. Chandler (who is new to Mexico—his eyes filled with a touch more wonder than me) asked a pair of locals what was the story behind the marathon. I translated to Chandler that this marathon, which took place only three days before Independence Day, was run from the nearby city of Santiago de Querétaro where the first 15 runners carried the flame of independence to be lit for El Grito in San Miguel de Allende. This was the first time I had heard of such a tradition, however as luck should have it, we came across runners all throughout our journey. 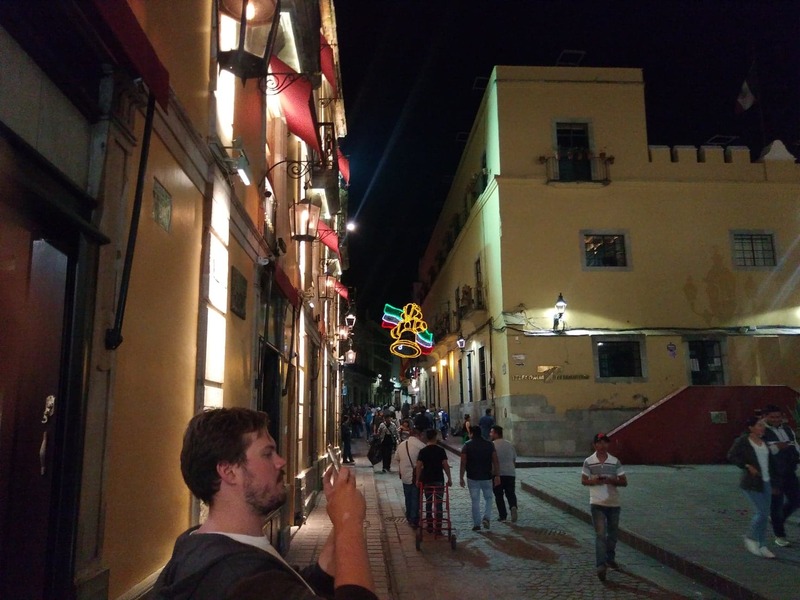 After some discussion, and some convincing by Justin, the Four Amigos decided that if we were going to search for the history of El Grito in San Miguel de Allende, we would have to head to Guanajuato City. 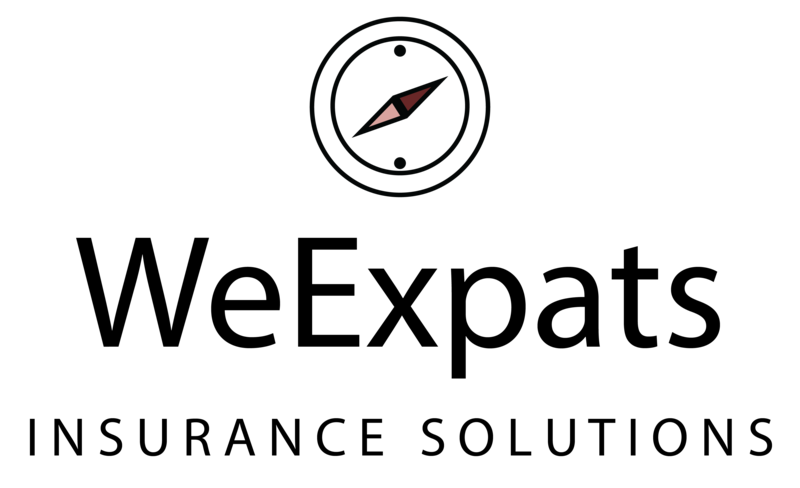 We would have to trace the Route of Independence. 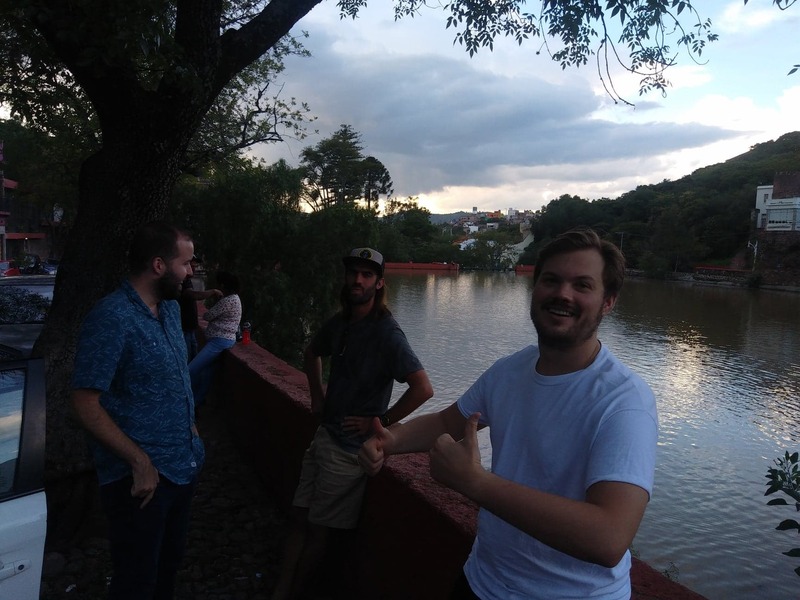 So Tim rented a car, we packed an overnight bag, and we headed to Guanajuato City. Justin basks in the moment while Independence Day decorations festoon the streets. Soon after El Grito, word of revolution spread through the surrounding area. The insurrection had begun, and Miguel Hidalgo traveled to Guanajuato City in an effort to liberate the state of Guanajuato. The Spaniards had gotten word of the rebellion and they had barricaded themselves inside a storehouse of grain called Alhóndiga de Granaditas. This granary was a fortress crafted with high stone walls, however its Achilles’ heel was that it had a wooden portcullis. The Spaniards managed to survive a siege of the Alhóndiga for two weeks, until a miner from the nearby town of San Miguel de Allende named Juan José de los Reyes Martínez Amaro—known by the nickname of El Pípila (a common word for a hen turkey)—tied a flat rock to his back to protect himself from musket fire and he stormed the gates of the granary. With a ball of tar and a torch, he heroically set fire to the wooden gates. The insurgents—who far outnumbered the Spanish soldiers—soon overtook the Alhóndiga de Granaditas slaughtering all the Spaniards inside. The charge on the gates of the Alhóndiga by El Pípila has been steeped in myth. Some accounts say he was accompanied by many indigenous miners and he did not act alone, however the myths insist he acted alone. A recent article went as far as to say there is no concrete evidence he ever existed, and that he is likely an amalgamation of several heroic acts as a tribute to the anonymous sacrifices during the Mexican Independence. However, I wouldn’t go toting this point in Guanajuato City—they take their hero very seriously. So much so that a massive stone statue of Juan José de los Reyes Martínez Amaro is lit up at night like an archangel overlooking the city skyline. The Four Amigos overlooking Guanajuato City on our trip back through Dolores Hidalgo to San Miguel de Allende. We absolutely loved our experience in Guanajuato City. The architecture is as fine as any quaint city on the Continent. We gazed slack-jawed at the colored Independence Day decorations festooning the Centro Historico. Processions of mariachis in traditional garb lead throngs of people singing corridos about the brave endeavors of the Guanajuatences during independence. Our night was slightly less brave, as we took in the sights between indulging in street tacos and churros filled with cajeta—a type of caramel like dulce de leche however made with goat’s milk. Our bravest moments took place on the stage of a karaoke bar in the centro histórico—yet nonetheless, you could feel the history alive in the vibrant sounds of culture and festivities. The next day was the 15th of September, and traffic was deplorable leaving the city. Winding roads and families loading their belongings down one-lane, architecturally-stunning streets lead to it taking half an hour to exit the city after a light breakfast of chilaquiles en salsa verde. We took highways that were more off-the-beaten path, however we felt perfectly safe because military police were in full force—patrolling the Route of Independence with a vigilant eye. This path took us through the small town of Dolores Hidalgo where El Grito began 208 years prior. As we drove the rental car to get back to El Grito in San Miguel de Allende, we came across several marathons emanating from the little town of Dolores Hidalgo. People stood at perfect intervals along the highway as one or two individuals would relay a torch and a Mexican flag from town to town, like the marathon Chandler and I had seen that first day in San Miguel de Allende. The lit torch carries el fuego simbólico de la cabalgata—a fire that symbolizes the fervor of the independence which spread along the Route of Independence like wildfire. 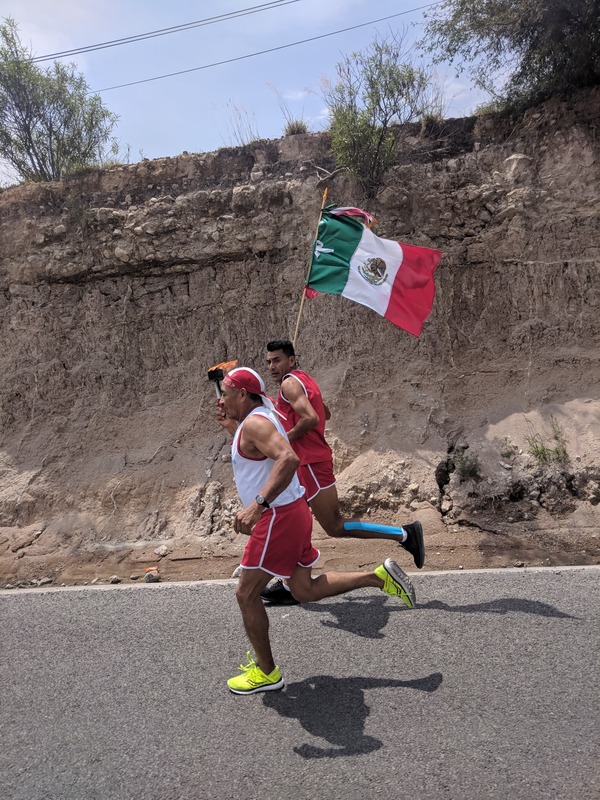 We saw three separate marathons that day traversing the highways for El Grito in San Miguel de Allende. 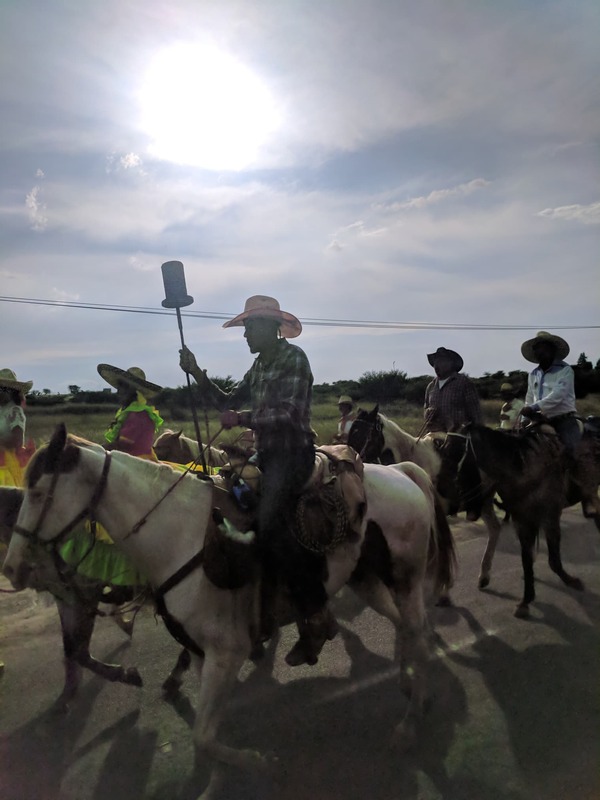 The next day on September 16th we even saw a mounted progression—a true cabalgata—making its way from the outskirts to town for El Grito in San Miguel de Allende. 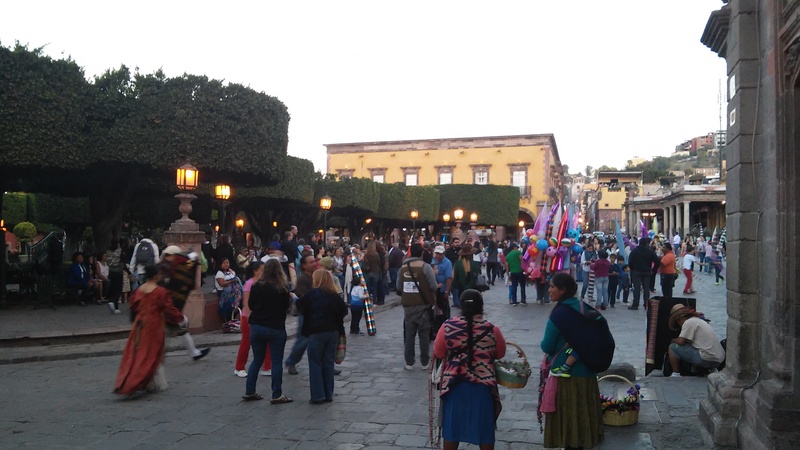 If you are ever fortunate enough to experience El Grito in San Miguel de Allende, you will see for yourself how the small pueblo bursts at the seems with people. Thousands of inhabitants, mostly from Mexico City and Santiago de Querétaro, swarm the small town to see the festivities and experience the charm of the hub of the Route of Independence. Live music swarms the streets, and people crowd the Jardín with their families and friends. This little town brims with life. One thing to note is that with so many people in the town square (called the Jardín by locals), the cash dispensers soon run out of cash and they will not be filled for several days, so be sure to stock up on cash before your trip in case you encounter an establishment like Tres Hojas which doesn’t accept credit card. Traffic is intolerable, so make sure to get in and out of the city early in the morning to avoid congestion. Once you’re in the city, don’t drive—parking is impossible. There are Uber taxis out and around, however the driver’s rate can be up to 5x their normal fare, so only take them if you are prepared to pay a hefty sum. A taxi—though a hair harder to hail than normal—will likely be far cheaper. At 11pm when the Mexican President shouts “¡Viva México!”, the fireworks display lights up the sky over the Jardín, and the live music begins to play in celebration of coming of the 16th of September: Mexican Independence Day. From anywhere in town, you can see the display as it shines brightly like a beacon hailing another year of freedom and pride in being in Mexico. The crowd begins to gather for Independence Day in the Jardin of San Miguel de Allende.